Several years ago, I wrote my first science fiction story in ages. “Backup” is a dark-hearted futuristic noir tale about desperate poverty and the lengths to which men will go to reclaim what is theirs. Backup was first published in Space Tramps, a Flying Pen Press anthology edited by the always delightful Jennifer Brozek in 2011. Unfortunately, Flying Pen Press ceased publishing fiction in 2013, and the books went out of print. 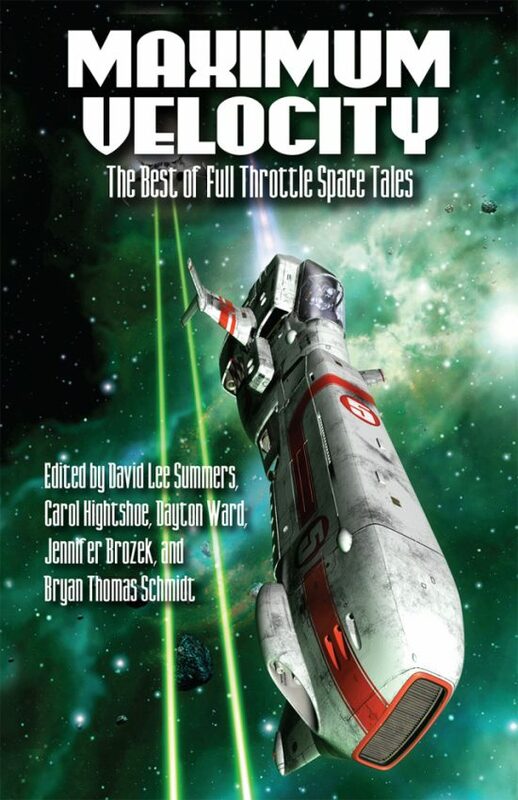 Last year I got an email from David Lee Summers, one of the leading minds behind the five Full-Throttle Space Tales anthologies. A new house was assembling a best-of anthology, and he asked if I’d like to re-publish my story! I immediately agreed, especially with the news that Jennifer would once more be editing. Duck Duck Goat is star chef Stephanie Izard’s “reasonably authentic” take on Chinese food, located in Chicago’s West Loop – the Fulton Market District. My friends Carl and Nancy snagged reservations in late May and invited us along for the ride. First off, let’s discuss the decor. Each room in this multi-room, high-ceilinged restaurant is decorated in a different but striking style. The lounge area is a lovely jade green, with a small but well-tended bar behind which rises an old fashioned mirror and about two dozen statues of goats. Many with lucky coins, others without. 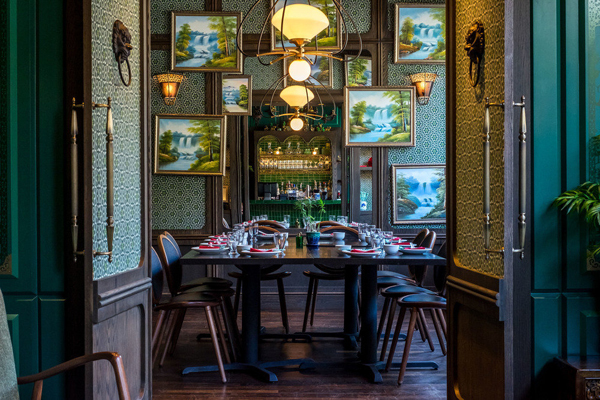 The room in which we ate was also jade green, but festooned with around sixteen different Bob Ross style paintings of calm forest waterfalls. You think they’re all the same at a casual glance, but if you look more closely you’ll pick up on the differences. The ceilings were dark cork for style and sound-dampening properties, inset with colorful crests and ornamentation. The main room feels taller as well as larger thanks to the exposed pipes and the mahogany shelves up where our ceilings were, filled with goods that give the feel of an Indiana Jones market set-place, well-lit against the scarlet walls. I could spend a happy hour just walking through the place and taking in the feel. We started in the lounge with Blind Goat Old Fashioneds: J. Henry Blind Goat Bourbon, Birch-Sarsaparilla, Angostura Bitters and an orange peel the likes of which I’ve never seen. Their mixologist really knows what he’s doing – not a hint of pith, and about as wide as a woman’s palm. Our lovely server Sara recommended two dishes apiece for a group of four, as the food is served family-style typically in sets of 3-5 items. We wound up with eleven dishes total, plus dessert and perhaps another cocktail apiece. Starters were possibly my favorite item of the evening: goat and duck skin spring rolls, lightly fried and served with two sauces. These little morsels could be a lunch for me and I’d be well pleased. The snap of the roll against the slightly musty flavor of good goat’s meat combined with the richness of rendered duck skin and the wonderfully hot mustard. After that, wood-grilled duck hearts in horseradish aioli sauce. The lovely copper tang of organ meats blended with a perfect amount of smoke, with sliced scallions offering some vegetal relief from the supreme richness of the meat and sauce combination. At the same time we were served scallion pancakes with hoisin sauce and cabbage coleslaw. I’ve never had scallion pancakes this light and airy – thin, crisp, and warmed just so to balance the coolness of the slaw. These two together were a lovely combination. After that we got pickled cucumbers as a palate cleanser followed by pork fried rice. I’m not normally a fan of fried rice, but the manner in which we were eating was protein-heavy, and carbs sounded like a good idea. (I would have preferred to try the Forbidden Goat, black rice with goat and pickled quail eggs, but I wasn’t about to push anyone at this stage.) The dish wasn’t as heavy or greasy as most fried rice, as I expected, and the pork belly and sausage were a real treat. Frankly, I could have stopped here and been immensely satisfied. But no, oh no! There was more on the way. Horn Shu Rao – braised pork belly – which was properly prepared, but a bit gelatinous for some members of our party. I enjoyed the entire thing immensely and wound up enjoying their servings as well. A plate of pickled mixed vegetables and a dish of the most amazing green beans in black bean sauce with fried onions and cashews I have ever had. These two vegetable dishes together gave me a world of enjoyment. Barbecue pork Bao buns, half apiece, really put me over the edge. These were good, and it may be my increasing discomfort, but I don’t think I’d get them again personally. On top of that pork we got jiazao – fried potstickers of short rib and bone marrow – which would rank as my second favorite items of the night after the spring rolls we started with. Completely different profiles, with these being rich and dark and smoky and divine; much better suited for the end of an evening. Of course, then we saw a plate of regular wood grilled short ribs being served at the next table and, being who we are, added an order of those. Again, I’m afraid I wound up eating more than my share as some in the party had believed they would be boneless rather than bone-in. Saucy, sesame-laden, and pillow-soft to the tooth once you got through the tantalizingly crisp wood crust. For dessert, blueberry and bullet chili sorbet topped with shaved rhubarb ice, “crunchy corn cereal” which I believe – but cannot prove – came from a certain Captain of the cereal industry – caramelized condensed milk, blueberries, and an incredibly delicious take on rhubarb slices that melted in the mouth. The bill was also … remarkably low. I have honestly had much less food at a similar price here in the suburbs, routinely. I had fully planned to spend twice what I did for this experience, which makes it all the sweeter. Admittedly, sleeping was an issue after that much rich and incredible food, but I’ll gladly trade a good night’s sleep for a meal I’ll still be thinking about for years to come. I am an unabashed fan of Duck Duck Goat and look forward to trying Chef Izard’s other locations in the near future. Let’s face it, we all procrastinate to some extent. The question of “to what extent” is what really separates us from one another, and separates the chronically late from the simply ill-prepared. I’m going to introduce you to three tools that moved me from the former category firmly into the latter. The first is a physical and analog tool. This, my friends, is called a Bullet Journal. I know, I know. It’s the information age, the digital age, the time of miracles and wonder. An age that requires us to be nimble and to move quickly. Our brains, however, haven’t always caught up with that age. We’re still wired to work in an analog setting. The Bullet Journal, developed by a clever young man named Ryder Carrol, works to blend the two. It has been scientifically proven that writing things out in longhand keeps them in our memory longer. At its simplest and most effective, the Bullet Journal consists of only three things: A number to every page, a topic to every page, and bullet points on every page. As an example, take a look at these two pages, 114-115. 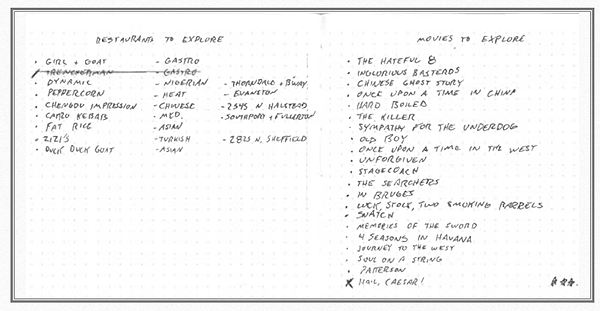 This is where I keep track of restaurants I want to try and movies I want to watch, or have watched. You’ll note that each starts with a bullet point, maybe a brief description. At the bottom of the movies page, there’s a variance – having watched the Coen Brothers’ HAIL, CAESAR, I made an X through the bullet point and provided my personal 3-star rating. It was a good film, but not their best work. Similarly, under Restaurants, I’ve crossed out Trencherman, which sadly closed before I was able to enjoy their fare. The page numbers allow me to create a quick index at the front of the journal. You can see how this system lets me take casual, one-off thoughts or comments and log them to remember later, when I’m actually looking for something to do. I find recommendations online or on television, and jot them down in the journal so I don’t have to remember them any longer. 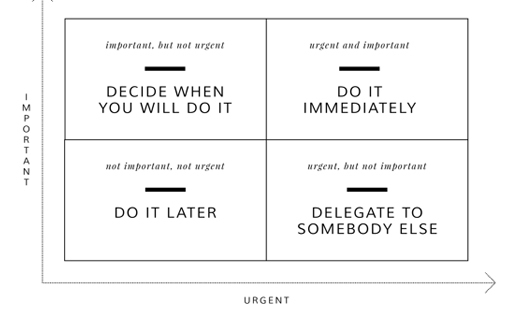 As such, the matrix consists of four quadrants: Important and Urgent, Important and Not Urgent, Urgent but Not Important, and Neither Urgent nor Important. Examples of those four might be tax deadlines, physical exercise or study, assisting co-workers with their deadlines, and – at least in my case – scrolling endlessly through social media. 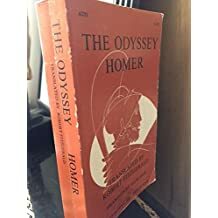 It’s a funny thing about our modern age that we spend most of our lives in the third quadrant, taking care of things that are Urgent – usually for someone else – but not truly important to us. Eisenhower recommended that you Do everything in the first quadrant as soon as possible. That you Devote the majority of your free time to the second quadrant. That you Delegate or Decline to accept items in the third quadrant. And that you Delete items in the fourth quadrant. I found that tracking these in my BuJo – and not even marking down the fourth quadrant – truly helped me begin focusing my time and energy where it was most important. 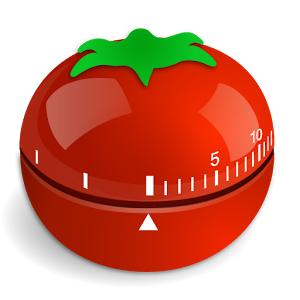 The third and final item that helped me with time management is called the Pomodoro Technique. Francesco Cirillo developed this in the eighties. The idea is that you can usually focus on ANYTHING for twenty minutes’ time. Therefore, when you begin a difficult task, you set a timer for 20 minutes. When that timer goes off, you ask yourself, do I need a break? If so, you take five minutes to stretch, check Facebook, or do other things Eisenhower would put in his fourth quadrant – then get back to another 20-minute block of work. I’m pleased to announce that Apocalypse Ink Productions has finalized the purchase of FAMISHED: THE RANCH – the third, and likely final, book in the Gentleman Ghouls series! For the next four days, I am reading the final proofs aloud to an empty room, in a last-chance effort to catch typos. I will NOT use this time to make changes, add words, edit scenes … that time has passed. Of course, I’m already finding things I would change; because this is how it works. In any creative endeavor, you will always find things you want to change. There’s no getting around it, but eventually, you have to let your creation out into the wild. In any event, the publishers will have the final copy in their hands by midnight on Tuesday, August 2 – and I hope that you, my friends, will have a copy soon. Thank you for your patience and support with this final push! Lyrics, And The Importance Thereof. So here’s the story about how lyrics I’ve known for over 30 years brought me to happy tears tonight. You first need to know that my wife, Leanne, is a fabulous artist. She makes amazing jewelry, and she had the courage to strike out on her own several years ago. Since then, the economy has performed its usual fol-de-rol, and as such she’s decided to take on a side job at a grocery chain. Her shift this morning was 6 AM – 2 PM, and she left the house before I was out of bed. As such, when I came home at 4:30 (PM), she was cocooned in a blanket on the sofa. While I am often out of bed before she is, it’s rare that I have a chance to see her sleeping and at peace; which brought this song to mind. My late father Craig Ewert loved Jethro Tull, and I inherited that love when he shared it with me. Several old friends have told me they think of me when they hear Ian Anderson sing, and that makes me happy. I kinda wanted to send Leanne this song, after watching her sleep this afternoon. But I’ve been burned by lyrics before, so I decided to double-check. And my mind, it was blown. A very Scots warning against over-reaching yourself. A very reasonable note that you won’t always succeed, that it’s all right to aim lower than you could, that nobody could blame you for settling. That really, in the end, you’re always going to fail. But tonight, before sending them to my sleeping beauty, I looked up the lyrics on Google Play. I’m still in tears, frankly, over this confusion. That for thirty or more years, I’ve held back. And that I’m not too old yet for faith. Thank you, Ian. 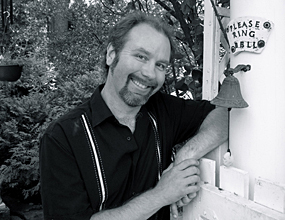 Thank you, the long-gone Mr. Tull. Thank you to the Blades. Thank you to Leanne for this gift, and thank you to my father, who bequeathed me with cynicism and hope in equal measures. Right. It’s a work night. No more tears, but thirty years of memories to unpack.